Aging can cause unwanted issues such as fine lines, wrinkles, and volume loss. Common areas where these occur include the cheeks, on the forehead, and around the lips. Without treatment, these issues can make your skin look more aged. To address or prevent these issues from worsening or even starting, the facial rejuvenation experts at Cosmetic Laser Dermatology can tailor a treatment plan that includes three non-surgical solutions from Juvederm: Voluma, Vollure, and Volbella. The Juvederm line of facial rejuvenation solutions from Allergan is known for effectively addressing several types of skin issues; in fact, each product in the line is formulated to correct issues in specific parts of the face. The main ingredient that makes each of these three so effective is hyaluronic acid, a hydrating substance found naturally in the body. Each of these solutions is formulated with a proprietary technology called Vycross, which combines various types of hyaluronic acid molecules to create the injectable gel. This limits the amount of moisture absorbed by the gel during treatment, which helps reduce swelling common with other gels. The result is a gel firm enough to hold its shape for months yet supple enough to be shaped for subtle, yet noticeable volume and move naturally with your own facial expression. In short, Vollure is created to reduce nasolabial folds around the nose and mouth. 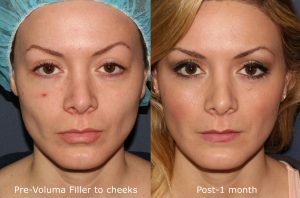 Voluma is formulated to correct volume loss in the cheeks and mid-face area. Volbella is designed to improve thinning lips and lip lines by making them thicker and fuller. Vollure is the first FDA-approved hyaluronic acid (HA) filler designed specifically to improve moderate to severe facial wrinkles and skin folds, such as the highly visible laugh lines (nasolabial folds). Vollure volume effects are normally visible for up to 18 months, though results can vary. Aging causes volume loss in the cheeks, which causes your face to look drawn, flatter, and sunken in. Without youthful cheekbone definition, you can appear older and more fatigued. Voluma is formulated to add volume to the cheeks and midface area, which improves the structure and symmetry of the face. Treatment with Voluma also benefits other parts of the face, including an undefined jawline, a recessed chin, and even under-eye skin laxity. The result is a perkier, healthier-looking appearance that can last for up to two years (although results can vary). Thin or thinning lips can result in a mouth with less shape and volume. Aging can also cause fine lines to form around the mouth as well as at the corners, which can result in a downturned mouth. To restore the lips and mouth for a more youthful appearance, Volbella is designed to enhance the outline of the lips, minimize the fine lines around the mouth (perioral lines), and accentuate the “cupid’s bow” at the center of the top lip. 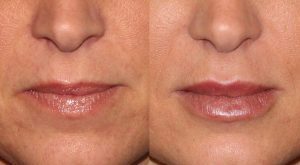 The result is added volume to the overall appearance with fuller, more alluring lips for as long as a year (results can vary). Unlike some other offices, at Cosmetic Laser Dermatology, facial rejuvenation with any Juvederm treatment is performed by our board-certified dermatologists. Combined, our experts have over 100 years experience with cosmetic procedures designed to minimize the effects of aging. Juvederm injections are generally quite tolerable, as they are administered using ultrafine needles, and the XC version of Vollure, Voluma, and Volbella means that a numbing agent is part of the formula, which ensures even more comfort during treatment. Furthermore, because you’re receiving treatment from highly trained, experienced dermatologists, you know you’re in the hands of physicians with the highest quality skill and technique. An additional benefit of these Juvederm treatments is that, because they are formulated with hyaluronic acid, the effects can easily be reversed in the unlikely event of dissatisfaction with the treatment. Altogether, side effects are minimized, and those that do occur are milder and subside more quickly than those of other fillers or those administered by other injectors. Such side effects could include swelling, bruising and discoloration, tenderness and soreness, redness, itching, and the rise of lumps or bumps on the skin. However, within a week, most side effects should subside. Treatment with Vollure, Volbella, and Voluma is minimally invasive. Recovery is typically quick and usually painless and simple. You can easily resume your schedule once you finish treatment, so going right back to work or to a meeting is commonplace. Finally, each of these Juvederm treatments can be performed in conjunction with one another if you have cosmetic concerns in more than one area of the face. They can also be used as part of a “liquid facelift”, in which any of these fillers is administered along with a neuromodulator, such as Botox, to augment the effects for truly enhanced facial rejuvenation. They also allow you an affordable option of making certain changes without the commitment of permanence, as with implants or rhinoplasty. Our specialists have treated more than 150,000 of your neighbors in the San Diego area. We will listen to your aesthetic concerns and goals before working with you to design a treatment plan that’s right for you. To know more, schedule a consultation today at Cosmetic Laser Dermatology.